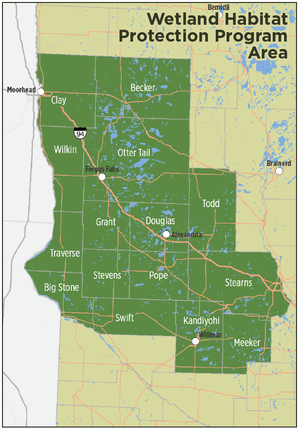 The Minnesota Land Trust is looking for willing landowners to participate in the Wetland Habitat Protection Program, a conservation initiative to permanently protect high quality wetland complexes in west-central Minnesota. This page will help you decide if the Wetland Habitat Protection Program is right for you. Below there is information about the program, conservation easements, project selection criteria, and an application. Receive tax benefits or other compensation for a permanent conservation easement on your wetlands and their surrounding natural lands. Preserve your family’s legacy on the land. Join a community of more than 550 dedicated landowners who steward over 55,000 acres of important Minnesota places. Receive a free habitat management plan, with the potential for financial and technical land management assistance. The Minnesota Land Trust is seeking landowners interested in securing a lasting legacy for their lands through conservation easements. Conservation easements are voluntary agreements through which landowners agree to limit the future use and development of their property to permanently preserve its natural features. Lands protected by a conservation easement remain in a landowner’s private ownership, with the landowner retaining the right to use and manage the land in line with the terms of the easement. Public access is not required. When the land is transferred to a new owner, the easement stays with the land ensuring it is permanently preserved for generations to come. Buffers of 150 feet must be established along all wetlands, intermittent and perennial streams, rivers and lakes prior to closing of the easement. The Land Trust uses certified appraisers to ascertain the value of your land without the easement, and then the value of your land with the easement in place. The difference between the two is the easement value. The easement value results from the property rights that have been restricted and the appraised value of those rights. 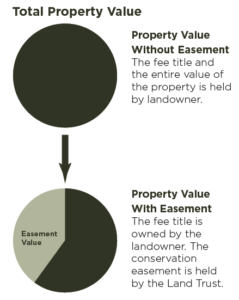 Upon finalizing a conservation easement with the Land Trust, landowners will receive a one-time payment for the amount indicated in their application, up to 100% of the appraised easement value. The Minnesota Land Trust is a nonprofit organization and the donation of all or a part of a conservation easement may allow the landowner to claim a tax deduction. Please consult your attorney. Be located within the Wetland Habitat Protection Program area (see map). Be at least 40 acres in size. Have wetlands or water bodies with in the proposed easement area or contribute to conservation of adjacent wetland habitats. Contain less than 10% of proposed easement area in cultivation. Applications will be reviewed, ranked, and prioritized as they are received. Applications received after the deadline may not be reviewed for the current phase of this program, but may be considered later if funding is available. Projects that are the best fit for the Wetland Habitat Protection Program will be larger in size and will have high quality natural lands with little development. Landowners must indicate their desired compensation—payment per acre—for the easement on their application. Please note that the Land Trust cannot pay more than the full appraised value of the easement. The Land Trust is able to conserve more land and may prioritize your property if you opt to donate some or all of the value of the conservation easement. Context relative to other natural and protected lands such as parks, wildlife refuges, etc. Landowner’s desired compensation on a per acre basis and willingness to donate some or all of the value of the easement. Ready to apply? Apply online here. For a paper copy of the application and landowner questionnaire, contact Kristina Geiger. Questions? Contact Kristina Geiger at kgeiger@mnland.org or 651-917-6295.